This is my guide for how to paint fabric with chalk paint – in this instance an armchair. If you can’t see the video please click here. It has become a joke in my family that I simply cannot leave things alone. They think I would paint my pet Dexter if he were to sit still for long enough. Note to any overly sensitive animal lovers: this is a joke and I have no intention of painting the cat. I think the latest project came as a surprise though. My nanna (glamorous lady on the right) is not your hoarding type and every so often has a good old clear out. The latest item to get the chop was this attractively shaped bedroom chair. Now I was rather pleased as I’ve wanted one for a while, but of course it’s not grey enough for my house. 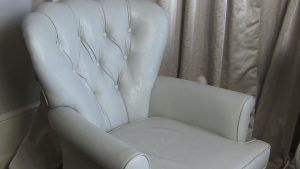 The first and most obvious solution was to have it re-upholstered. I dutifully looked around, but unless I was prepared to actually sell my nanna to pay for it, this wasn’t a viable option. I feel really guilty saying this because I always like to support the skills of yesteryear. Quotes for this support were upwards of £700 though. I’m not even sure the chair even cost that originally! Now I’m well aware that I will not be the first person to have painted fabric. It is something I have avoided as I just couldn’t get my head around it. So if you are thinking this is a strange idea, do watch the video to see the outcome. It’s worth pointing out that a part from a bit of staining the chair was in pretty good condition. If any repairs are needed I’m not sure how well it would have come out. This is not a job for a lazy Sunday afternoon as you should wait about 24 hours in between coats. I decided to use Winter Grey Rustoleum chalk paint. My choice was partly due to knowing it would go with my bedroom. I also happened to have a tin of it in the cupboard! You might want to water down the chalk paint so it spreads easily. This was the advice I was given and to spray the fabric with water first which I started off doing. What I found actually was that if I dipped the brush in water and then into the neat paint it spread easily. It also didn’t take as long to dry. 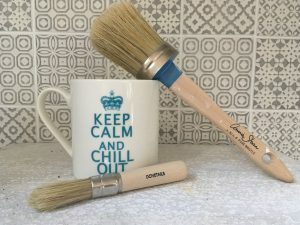 It’s worth using the large Annie Sloan pure bristle brush as it works so well with chalk paint. It also gets round any curves and detail easily. Remember to get into any creases. When you sit on it these are likely to pull apart and show the original colour. In the end I found using a stubby stencil brush to get into these worked best. After each coat leave for around 24 hours. Remember it’s not just the paint but the fabric that also needs to dry before you do the next coat. After the first coat I could still see the pattern underneath – particularly in areas where I’d watered down the paint too much. I actually found that two coats was enough, but this will be very much dependent on the fabric and colour used. Before waxing sand with a very light, flexible sanding pad and brush any dust away. Don’t judge me for the state of my nails by the way – it’s been a tough week! I plumped for my favourite Ronseal White Ash Interior Wax to finish it off and protect from grubby fingers. I love this stuff because it’s easy to apply as it’s liquid so you just use a brush. It also gives more of a matt finish than other waxes. Now remember I wasn’t convinced myself before I did this, but I loved the shape of the chair and had nothing to lose really. I can honestly say though that I am thrilled with the result and would urge you to do the same with anything that needs some TLC or when you’re just bored of the colour or fabric. clothes, my toddler Bonnie and I have tested it out! It’s also worth pointing out though that there’s no going back afterwards and if the seat cushion is removable it might be worth doing a trial patch first! If you want to start off on a smaller scale, why not experiment with painting some of the mirrors in your house – click here for some ideas to get you going. Well done Bonnie, brilliant job! 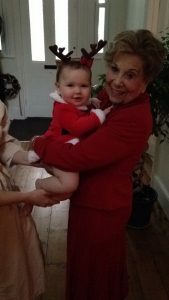 My mummy won’t be taught anything – you try! Amazing result!! I have heard that the Forth bridge needs a coat or two. You up for it? I am if you are?!! Oh boy oh boy did I hold my breath when I watched you start painting the fabric on that chair! What a fantastic result! I’m definitely on the look out for chairs that I can do that to now – really brilliant! What a little superstar you have working with you too! Thanks Georgina keep them coming. Yeah must admit it really felt like a risk, but want to do more now! I didn’t think that was possible! It looks really good. I have a question. I painted fabric on a wicker piece. If I put this on my porch in the sunlight< is it ok to put on the wax? I would like to put on the wax, but someone said not to do it that the sun may melt it. What is your opinion? Ooh I must admit I’m not sure about that. I know that the wax doesn’t react well with water so when chalk painting for outside you’re better off not putting it on and going for the weathered look, but I’m not sure about inside in the sun. I’ll be honest I’d be very surprised if it were a problem. I would maybe use the ronseal interior wax which you can brush on. It will be easier on wicker and very hardy, but it may be experimental. If it does go strange you can always paint over the top of it. My concern about not having any finish is the chalkiness of the paint on your clothes when you sit. Please do let me know how you get on. My question is , can I put it on the fabric only? The wicker is not painted with chalk. The chalk painted fabric is only on the back. I’m wondering why you didn’t use a fabric medium mixed with the paint? 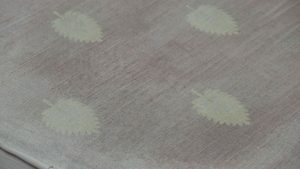 I am about to do a chair in a guest room and everything I’ve read or seen (with the exception of your video) says to use that additive to the fabric. I knew about the ‘extra damp’ fabric and about adding some water to thin the paint. I also keep seeing that the first coat will probably not do the trick, so I was prepared for that as well. Any idea about the fabric medium? And btw, the chair is fab and your daughter is darlin’! 1. My loveseat has wood trim; can I use the same paint on the wood? 2. What is the “wax” you mentioned? Is it also for fabric? 3. Does the fabric now feel stiff since painted? Does it crack or anything strange? Thank you again for your delightful tutorial and amazing ideas. Yours is the BEST tutorial I have viewed on this topic. Thank you so much Julia. Yes you can use the same paint on the wood, you shouldn’t need as much – worth lightly sanding or at least wiping with sugar soap just to remove any grease. There’s a link to the wax on the blog post – it’s Ronseal interior wax – you can use that on the wood as well. Yes the fabric doesn’t feel hard, more like the texture of leather, but still comfortable and mine hasn’t cracked. Bonnie is constantly playing on it and it’s been really hard wearing – couple of marks but I can just paint over those!! !